Albert Camus (1913-1960) is a French novelist, essayist, and playwright. Some of his novels include The Stranger (1942), The Plague (1947), The Fall (1956), and A Happy Death (Published posthumously in 1971). 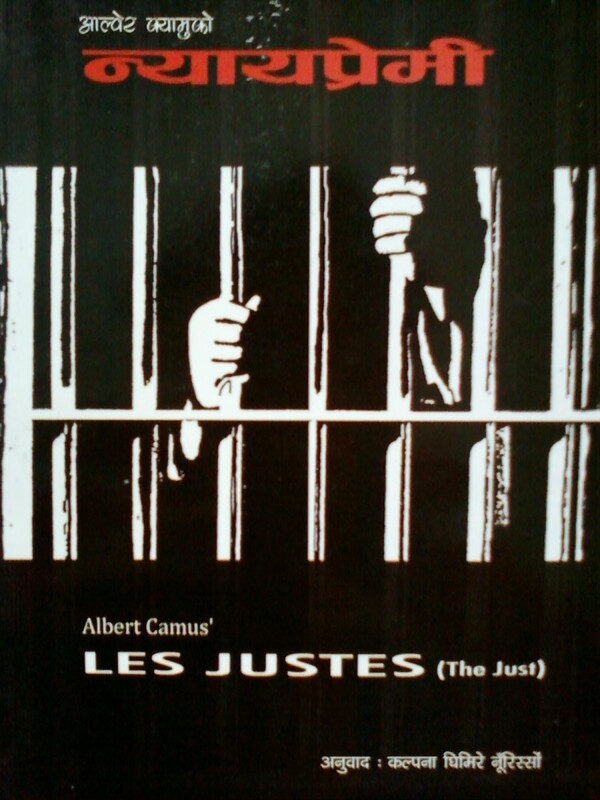 Les Justes (Titled The Just by some English translators, while others prefer to use The Just Assassins) is a play written in 1949. Camus also devoted his writings to leftist causes. He was awarded the Nobel Prize for Literature in 1957. We are nearing the birth centenary of Albert Camus (1913-1960). Recently, half a century after the death of Camus, Giovanni Catelli, an Italian scholar, claimed that the car accident that killed Camus was planned by KGB by puncturing the tire. There was no such rumor when Camus died. Interestingly, Camus had said, “Death can occur at any moment, even or perhaps especially in cars. The feeling of absurdity can strike any man in the face.” According to Camus, death is not absurd or meaningless because it results from chance or a mishap, but instead because we refuse to accept the very possibility of senselessness. Les Justes is a play about the ethics and morality of a group of people that believes in socialist utopia by terror tactics. The play is based on the true story of assassination of Grand Duke Sergei Romanov in 1905, by Russian Socialist Revolutionaries. Duke Sergei was the uncle of Tsar Nicholas II. Ivan Kaliayev, the 23-year old murderer is the protagonist of the play. In the author notes, Camus writes "...The Just is (not) a historical play. 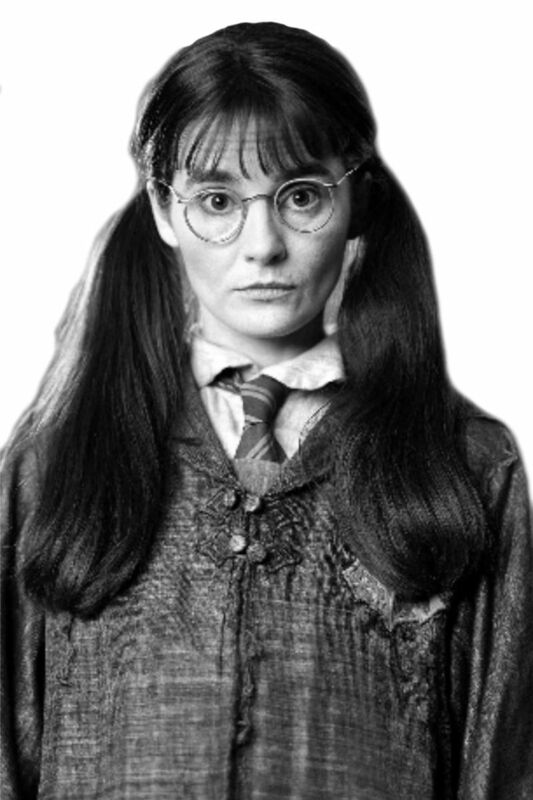 But all the characters did actually exist, and behaved as I have written. I only tried to make realistic the things which really happened." 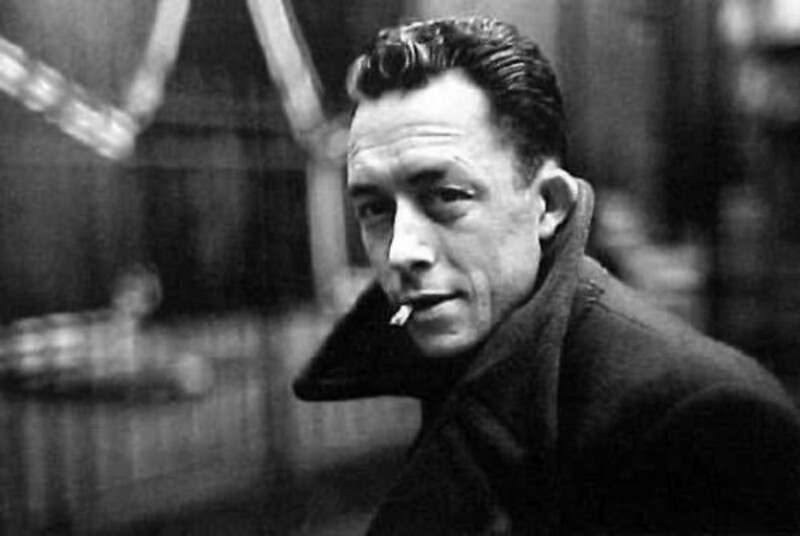 Since we witness political assassinations and high profile murders, every now and then, in our modern world, we can easily assimilate Camus’ play with our time. Stepan and Kaliayev are interesting characters in Les Justes. The destination is same for these two men but they want to tread different paths. “Liberty is still a prison as long as there is still anyone in chains on earth,” says Stepan (Act I). It is surprising, Kaliayev, who is going to hurl bomb at Grand Duke can say “Beauty exists, joy exists!” But he is a poet who muses, "In the tranquil places where my heart wishes you..." in a place where they are planning a murder. Kaliayev says, in reaction to Stepan violent idea of revolution, “...make me into an assassin when I am trying to be a maker of justice” (Act II). Let’s look into another conversation in Act II. Stepan: We are murderers and we have chosen to be. Kaliayev: No. I've chosen to die so that murder will not triumph. I have chosen to be innocent. Quite true, we can now understand the minds of assassins, even though we may not approve murders in the name of politics and revolution. The play explores the idea of rightful violence, and the characters believe it is right to kill people who inflict violence. 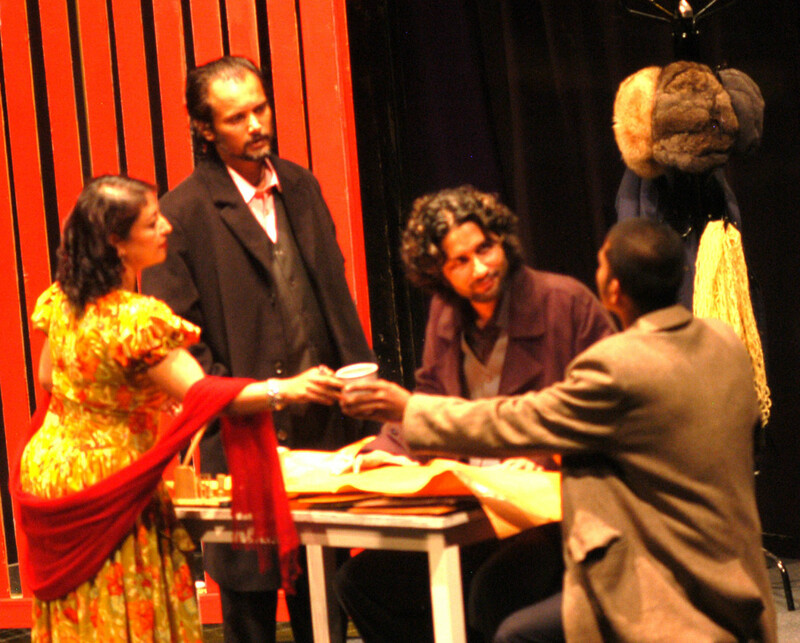 The productions stills, photographed by Deependra Dajracharya, are from the play Les Justes produced and performed by Aarohan-Gurukul, Nepal. 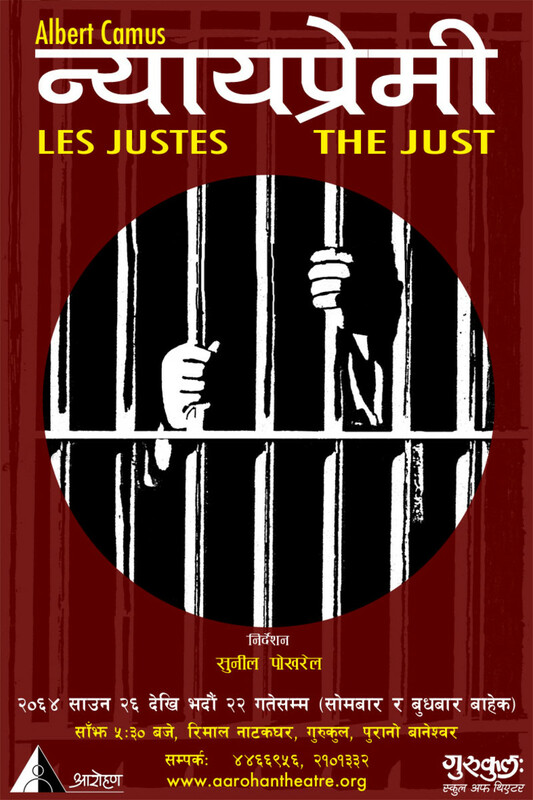 Les Justes has also been translated in Nepali and published in a book 2011 by Gurukul, School of Theater. Gurukul is sister organization of Aarohan Theatre Group, Nepal. The play was first performed in 15th December, 1949 in Paris, while in Nepal it was performed for the first time in 1991 in Kathmandu. Since then, Les Justes has been performed at least 40 times in Nepali stage, and most of the performances were staged by Aarohan-Gurukul. 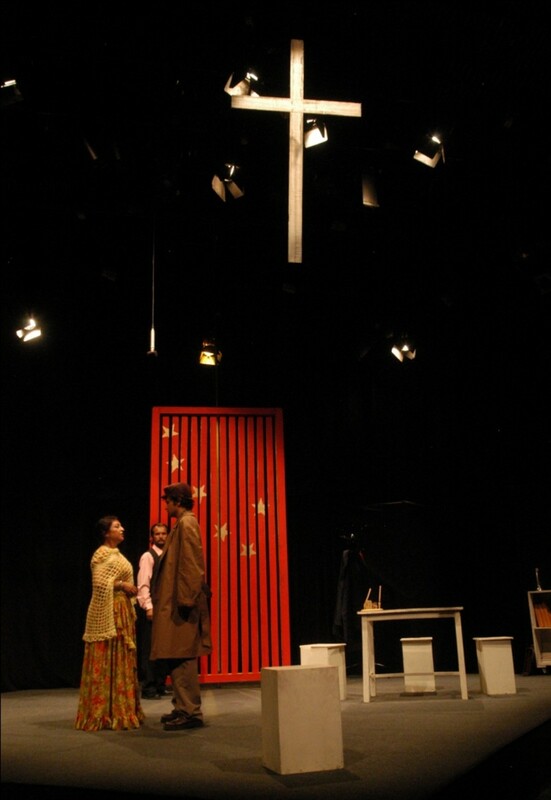 The Nepali translator of Les Justes, Kalpana Ghimire, uses Nayapremi, The Justice Lover, as the title of the play. 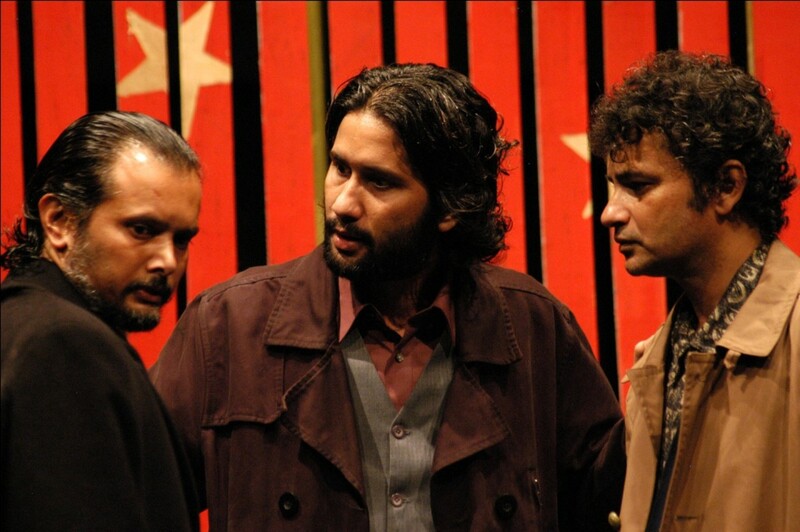 Sunil Pokheral, director of Aarohan-Gurukul is also the conceptualizer and director of the Nepali version of the play. When the Les Justes (Nayapremi) was performed in Nepal, in 2007, it became instant hit, not only because the Nepali people had become spectators of political killings during the decade of bloodshed due to “People’s War,” Nepali version of Chinese Communism, but also because of the actors. 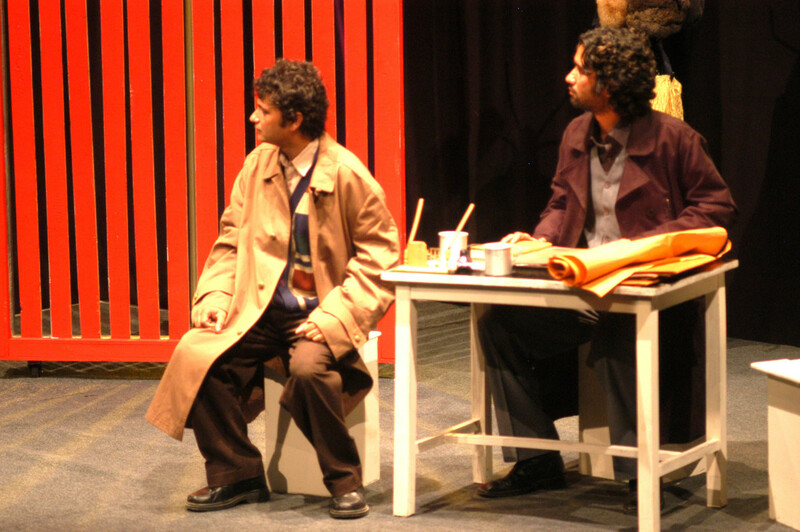 Sanjeev Uprety and Dil Bhushan Pathak, who were quite unknown to the theatre audiences, became the talk of the town. Uprety is the Professor of English Literature and Pathak is well known media person. A well known playwright John Osborne has said, "I want to make people feel. They can think afterwards." It is this emotional content in Les Justes that largely helps to sustain audience interest from start to finish. Our emotions vary from one episode to another as the play progress - from involvement to concern to anxiety. Though I have not read much from Camus, I have always loved his writings, and also loved to watch his plays. Violence has been inflicted upon our people by Communist revolutionaries for more than 10 years. And I don't believe in righteous violence. Up, Useful, Interesting, and shared. Thanks for the good review. I've admired Camus since I read some of his works in college in the early 1960s, but this is the first time I heard of Les Justes. I am strongly against the doing evil to supposedly achieve good mentality and consider such self-righteous evil to be the worst of sins. That is a major theme in my novel THE SON WHO PAID ATTENTION. "Witches" were burned alive by the hundreds of thousands in Europpe; Hitler and Stalin headed regimes that killed or imprisoned millions, governments past and current did and do practice torture,and some societies have "honor killings",all in the name of the end justifying the means. In my youth I read a number of books by and about Mao, and I don't recall his using that expression. Stalin did say, "You can't make an omelet without scrambling some eggs." I asked Google and learned that the Greek playwright Sophocles wrote in Electra (c 409 B.C. ), "The end excuses any evil," and Roman poet Ovid wrote, "The result justifies the deed," in 'Heroides' (c. 10 B.C.). Some online sources attribute the Italian proverb ""Il fine giustifica i mezzi" to Machiavelli. I often heard and read the expression, "The end justifies the means," in the USA in the 1950s and early 1960s as part of discussions about the morality of the policy of nuclear bomb "massive retaliation". You might also like the plays Danton's Death by Georg Buchner and The Persecution and Assassination of Jean-Paul Marat as Performed by the Inmates of the Asylum of Charenton Under the Direction of the Marquis de Sade by Peter Weiss. Hi Lisa, thanks for reading. Well written article:) Great job! Justsivile, thanks for your comment. Les Justes is a great work. I must admit I am new fan of Camus and your review of Les Justes motivates me to read it. Thank you! Camus and Kafka both are existentialist. Thanks for reading. Camus was indeed a great writer.Like Kafka,he stirs emotions in a rather "matter of fact way". Well written review. Wow, interesting input on Sisyphus. Thanks for your appreciation Bobby. 7 years ago from Deep in the heart. Nice Vinaya. I could heap praises on your writing but what impresses me most is how much interest you have created in others to explore this great philosopher’s work. On a more personal note, I too love the Myth of Sisyphus and since I read it I no longer look at my rock as a chore, but rather as a mission. Voted up and awesome. inko, thanks for stopping by. My favorite is Myth of Sysiphus. i love Camus. One of the favorite works that we had to study in school was by him. Prasetio thanks for reading and leaving a comment. Nice review and I learn much from you. Thanks for writing and share with us. Take care! 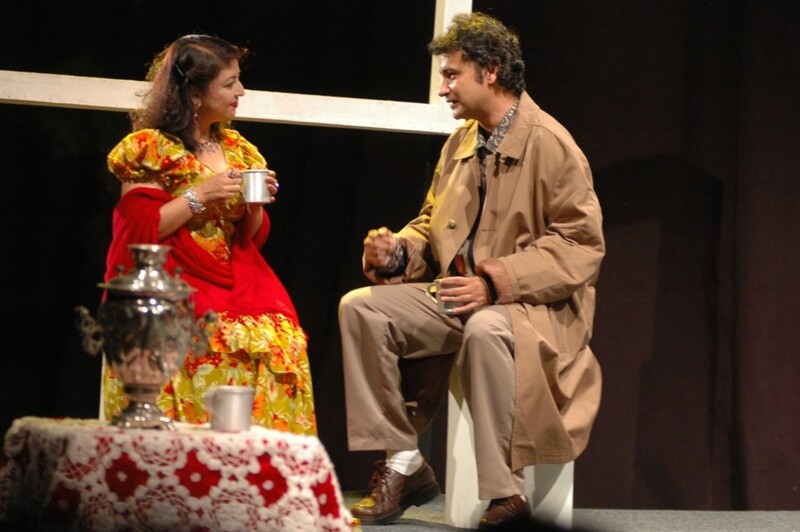 Flora, I had not heard about this play until I watched it in Kathmandu. Mom is a big fan of Camus. I wonder if she has heard of this play? Hello Claire, recently Les Justes was performed in Kathmandu and the Nepali adaptation of the play was published. I enjoyed reading as well as watching the play. Great work on Camus's work - no pun intended ^_^ I remember in high school, I read "The Stranger" (in French of course) just to be able to write the third part of my philosophy essay... read the book in one day... I never read Les Justes, but I surely would like to now. Thanks for a great, instructive and interesting hub. Studying Camus is like exercise for my brain, expanding my range of thought and perspective. Your review inspires me to learn more. Shea thanks for leaving an interesting comment. I believe it depends on people and the time. Sometimes I want to feel for the characters, sometimes I only think about the art, and sometimes all I want is enjoyment. This is very interesting and begs the quesiton, 'what is the real purpose of art?' should we feel for the characters or should we leave the experience of art and feel for the people whose experience is reflected in the art? Thanks for leaving comments. Camus is one of the best writers of 20th century. Awesome review! Interestingly enough, I just came across a few books written by Camus about three days ago. I will have to read this play - thanks for sharing a little of what you know here. Cheers!